One of the first wild herbs I learned to identify is Yarrow. You can easily identify it by it's tiny white flower pedals and feathery green leaves. They grow all over the place in Colorado where I live, and it is a very good plant to know about for survival because of its medicinal properties. Some plants are good for only one thing, but Yarrow has multiple medicinal uses, so knowing it and how to use it can save your life if you find yourself stuck in the wild for any length of time. So without further ado, here are ten uses for Yarrow! Blood coagulant: The first thing I learned about Yarrow was that the ancient Greeks used to use it to treat wounds after battle. One of the reasons it was used was that it is a natural coagulant and can help stop bleeding. This is useful not only for cuts and abrasions, but to help stop simple things like nose bleeds. This property is found in the feathery leaves. Antiseptic: Another reason Yarrow leaves are good for packing wounds with is that not only are the leaves a natural blood coagulant, it has antiseptic properties as well which are useful in preventing infection. Fever reducer: If you boil the leaves of Yarrow and make a tea out of it, or use it in a bath at the you can use it to reduce fever. Treat high blood pressure: If you mix Yarrow leaves with Nettle and Lime blossom in a tea you can lower your blood pressure. Treat tooth aches: Chewing on the roots of the Yarrow plant can numb the inside of your mouth and lessen the pain of tooth aches. Treat menstrual cramps: Again, used as a tea it can help during that special time of the month for women. Antibiotic/Antimicrobial: Another cool thing about Yarrow tea is that it has antibiotic/antimicrobial properties that are perfect for treating illness related to bacteria. Bug repellent: If you take the leaves and rub them on your skin it will keep the bugs away! Treat rashes and other skin irritations: Rubbing Yarrow leaves on a rash, a bug bite or other skin irritation will help reduce itching and discomfort. Reduce bruising: Rubbing yarrow on bruises or even blood blisters is supposed to help with blood flow and reducing the appearance of bruises or other conditions where blood rises to the skin. Yarrow is a really good plant to know in the wild because of its many benefits. 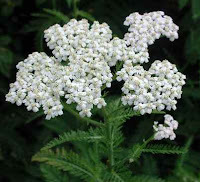 If you only learn one medicinal herb, I recommend Yarrow.